Nope, you didn't read that wrong: there's a new type of chocolate on the market - dark milk chocolate, or at least that's what Videri are trying to do. The independent company behind some of the newest 'extra dark' chocolates in town, have taken milk chocolate a step further with their Dark Milk Chocolate (£6.00). Dark milk chocolate sounds like an oxymoron, but it's not in fact, it's simply a milk chocolate with a higher amount of cocoa. 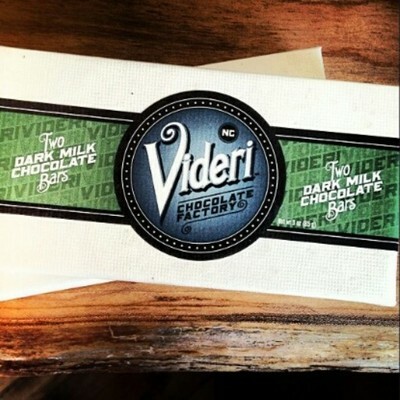 Videri have upped the cocoa mass content of this milk chocolate (around the 50% mark), which transforms it from a rather standard bar of decent milk chocolate, to something altogether different. I'm sure I've said this before, but to improve chocolate, you should add more chocolate, and that is exactly what Videri have done. This bar is really quite unusual, but it tastes how you might expect it; a very good and smooth bar of milk chocolate, but more intense. It has deeper notes to it, but it hasn't lost the creamy and sweetness I was hoping for. This dark milk chocolate bar is like biting into a luxury bar of milk chocolate, with the not-so-subtle inflections of dark chocolate coating your mouth too. It has a definite 'hit' of cocoa, which might take you by surprise, but the bar is notably darker than the average bar of milk chocolate, and is definitely not a bar of milk chocolate. Unlike the rest of the Videri bars, this dark-milk mix contains organic whole milk powder, and that's the difference. The addition of dairy softens the edge of this chocolate, and lends a creaminess typified in milkier combinations. It's the perfect 'in-between' bar, for those who are on the fence about dark chocolate. This is a nice introduction, but also satisfies the dark chocolate lovers out there. I don't recommend using this in place of dark chocolate when cooking, but if you're in need of a quick chocolate fix, and want something not too sweet, but still indulgent, this is perfect.